Crisscross Strap. An alternative to traditional backpack straps, the adjustable straps allow users to wear the child carrier with the straps crisscrossed in the back for a longer duration of baby carrying and a better fit for petite users. BALANCED WEIGHT DISTRIBUTION - The padded shoulder straps help evenly distribute your baby's weight in combination with the waistband to maximize parent comfort by alleviating pressure on the wearer's back and shoulders. 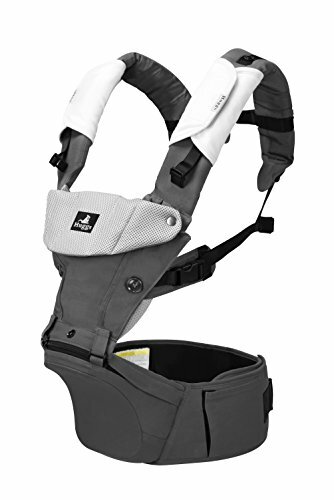 The neck support adjusts to support your baby's head and neck for greater comfort and safety. An ideal baby shower registry idea for infants, baby shower gift for expectant moms and an ideal baby holder carrier for grandma and grandpa when baby-sitting. If you have any questions about this product by Abiie, contact us by completing and submitting the form below. If you are looking for a specif part number, please include it with your message.